* Just as the eyebrows approach each other, so are the temptations close to men. It was the economy of God to be so, with wisdom that we may receive benefit: namely, through knocking persistently, because of the sorrows, on the door of God's mercy and to enter into your mind, due to the fear of grievous events, the seed of the memory of God, so that you may approach Him with supplications and your heart be sanctified through the continuous remembrance of Him. And while you ask Him, He will listen. * The person walking the road of God must thank Him for all the sorrows that he faces, and to accuse and dishonor his negligent self, and know that the Lord who loves and looks after him, would not have allowed the grievous things to happen to wake his mind up, if he had somehow not been negligent. God may have allowed some sorrow because man has become proud and consequently he should understand and let him not become disturbed but find the cause within himself, so that the affliction may not double up, namely to suffer and not wish to be treated. "In God who is the source of justice there is no injustice". May we not think otherwise. * Do not avoid the sorrows, because being helped by them you learn the truth and love of God well. And do not fear the temptations (negative experiences) for through them you discover treasures. Pray that you may not enter into spiritual temptations, while for the bodily ones, prepare to face them with all your strength, for without them you cannot approach God. Through them comes the divine rest. Whoever avoids the bodily temptations avoids virtue. * Without temptations the providence of God for man does not manifest itself, and it is impossible without them to receive the boldness in God and learn the wisdom of the Holy Spirit and moreover, it will not be possible to anchor the divine love in your soul. Before the arrival of temptations, man prays to God as a stranger. From the moment however he enters into temptations for the love of God and does not change opinion, let's say, he has God duty bound towards him and God considers him a genuine friend. For he fought and conquered the enemy, to fulfill the will of God. * God does not grant any big grace without a big temptation preceding it. For according to the severity of the temptations the graces were ordained by the wisdom of God, which men normally do not understand. By the measure of the great sorrows that the providence of God sends you, you understand the great value that His magnanimity grants you. For according to the sorrow you experience is the consolation you will receive. * If you ask me what is the reason for all these (temptations), I will answer you: your negligence, for you did not bother to find the cure. The cure of all of them is one, and with it man's soul finds immediately the consolation it longs for. But what is the cure? "It is the humility of the heart". Without it, it is impossible to destroy the fence of temptations. In the contrary you will discover that the temptations become stronger and weaken you. * According to the level of humility, God gives you the strength to endure calamities. And according to the measure of your patience, the weight of your sorrows becomes light and so you are consoled. And as you are consoled so does your love for God increases. And as much as you love God that much greater the joy of the Holy Spirit bestows on you. Our compassionate God wishing to bring the temptation of His true children to a good end, does not take but instead gives them the strength to endure. "All these gifts (consolation, love, joy) the strugglers acquire as fruit of their patience" for their souls to arrive at perfection. I wish our Christ and God to make us worthy through His grace to endure the bitterness of temptations for His love and with gratitude of our heart. Amen. * The saints show their love to God indeed, by their suffering in His name. When for example He sends them sorrows, without however distancing Himself from them, for He loves them. Through this suffering love their heart obtains boldness, so that they may approach Him freely and with conviction that their supplications will be heard and realized. The power of prayer that has boldness is great. That is why He allows His saints to experience every sorrow and acquire experience and be assured of His help and how much He provides and cares for them. This way they acquire wisdom and good sense from temptations, that they may not become negligent, that they may not lack spiritual asceticism on both good and bad, and thus receive through their trials the knowledge of all things they would need. For otherwise they will be swept away by ignorance and will become the mockery of demons. For if they exercised only in the good things and had no experience of struggles with the evil, they would have gone to war totally unprepared. * Man cannot taste and value the good, if previously he did not experience the bitterness of the temptations. * Men come to the true knowledge, when God deprives them of His power and makes them to co-experience the human weakness and the difficulty that temptations cause, the cunningness of the enemy, and what adversary they have to fight and how much they have advanced and progressed in virtue, and that without the power of God they are weak towards any passion. God does this, that they may receive from all these negative experiences true humility, and to approach close to Him and wait for His certain help and to pray with patience. So where could they learn all these but through the experience of many sorrows which He allows for them to experience? For this way one acquires stable faith through these sorrows while he is assured of the divine help that he many times receives during his struggles. * The strugglers, therefore, are tempted that they may increase their spiritual wealth; the negligent though to protect themselves from whatever hurts them; the slumberous that they may be awakened; the distant ones that they may approach God; and the friends of God that they may enter His holy abode with boldness. A son inexperienced in life cannot manage the wealth of his father and help him. For this, in the beginning God sends difficulties and hardships to His children and then He reveals His gifts. Like little children become frightened of scary sights and run, grabbing at the dress of their parents and asking for their help, so does the soul; the more upset and saddened by the fear of temptation the more it runs and clings to God and begs Him with unceasing supplications. And as temptations fall on it, one after the other, that much more it prays. However, when they stop and it recovers its comforts, normally it loses touch with reality and distances from God. * The sorrows and dangers kill sensuality, while good times and indifference feed it. For this both God and the holy angels are joyful in our sorrows, while the devil and his accomplices are joyful when we are lazy and have a good time. * Leave your cares to God and in all your difficulties judge yourself, for you, yourself, are the cause for all. * All the sad occasions and sorrows will torment us doubly if we have no patience. For with patience man turns away the bitterness of afflictions, while pusillanimity gives birth to the despair of hell. Patience is the mother of consolation; it is spiritual power that is born of a broad heart. It is difficult for man to find this power during sorrows, if he does not have the divine grace, which he acquires through persistent prayers and with tears. * Sorrows bring good returns to man, while vanity and pleasures bring evil things. * The accusations of people cause sadness in the heart, but they become the reason for determination to him who persists. * If by chance you were harmed, accused and persecuted by someone, do not think of the present but look toward the future. You will then perceive that these have brought forth good, not only in this life but also in the future one and without end. * As bitter medicines are beneficial to sick men, so too they are for the bad people of whom some are led to a healthy soul; and for others, sickness prepares them for repentance. * All sorrows that happen in this temporary life, compare them with the goods of eternal life and you shall not be found negligent in the struggle of this life. * He who consciously avoids sorrows for the truth, whether willingly or unwillingly, will suffer greatly by Divine Providence. * Patience is a great virtue during the various trials that will come to us, and in parallel our love to those that hate us. * Virtue without sorrow is untested because it is born of no sorrows. * In sorrows God rests, in comforts the devil who is the cause of all evil. Temptations are always beneficial, suffice we endure them with fortitude and praises to God. * Avoid temptations with patience and prayer. If you wish to confront a temptation without these, it will come back at you much stronger. * Events that now appear as calamities, later prove God's blessings. * If there were no sorrows we would not seek paradise. * We should accept sorrows like we accept the suffering of a surgery in order to regain our health. Hardship humbles man and the more he becomes humble, the closer he approaches God. * In the great sorrows only God can console us. For this, the best thing is prayer and not so much words of consolation. * Question: Elder, why does God allow just and virtuous men to suffer horrible sicknesses? Answer: That they may be cleansed from even the slightest traces of passions and that they may receive a greater crown in heaven. Besides, since He allowed His beloved Son to suffer and die upon the Cross, what can we say about people, who, no matter how saintly they may be, they bear filth and stains from sin? * The greatest asceticism is to bear without groaning whatever comes our way in this valley of tears. He who persists to the end is saved. 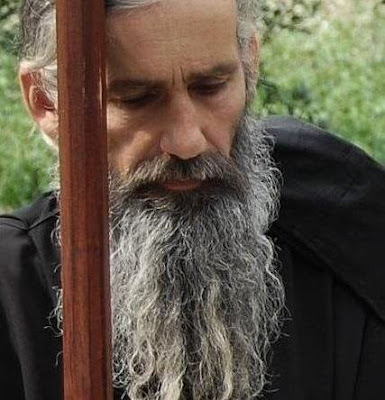 * If you suffer sorrows with forbearance, you testify of your loyalty to Christ, your devotion to the Saviour and your love for Him, who was resurrected from the dead and calls us to approach Him. * Under no circumstances allow any sorrow to overwhelm you. Depression is the executioner that deadens the spiritual effort which is necessary for the acquisition of the Holy Spirit in the heart. A depressed man loses the capacity to pray and is dead for the spiritual struggles. * With complete trust let us cry out and live the [call of the Divine Liturgy]: "We commit ourselves and each other and all our lives to Christ our God". * Let is entrust our life to God, and may it be done as He wishes. Whatever the outcome may be for us, that's the one that is for our good. For God does not want the perdition of man, but his salvation. There is no need for despair, rather we should have courage and hope in God. Despair is disbelief. He who sincerely believes in God never despairs. You despair because you don't believe in the power of God, Who governs all things. * When you have a difficult case, you hand it over to the lawyer; and you don't speak, he speaks for you. And so it is now. Entrust what bothers you to God, and He will take it over. Run to our Christ, implore Him to give you strength, do not despair. You are the work of His hands. He will help you.